It's a shame Wincing the Night Away didn't exist a few years ago, because several of its songs would have worked well in the movie "Eternal Sunshine of the Spotless Mind." And there might be a few memories James Mercer would like to erase. Like the one that prompted him to write "Let's carve my aging face off / Fetch us a knife, start with my eyes / down so the lines form a grimacing smile." steer the songs closer to a marshmallow world than a world of pain. "Phantom Limb," the album's first single, is a standard Shins chirper that slowly grows on you until you realize one day that you're unconsciously humming it. It might be the best palate cleanser on corporate radio today. It's also deceptive. It feels like a three-minute song, but it's almost five, thanks to a long outro of Mercer singing "ooooooo-whoa-oh, ooooooo-whoa-oh," with lovely backing vocals by Anita Robinson of Viva Voce. "Red Rabbits," on the other hand, founders with its half-cooked lullaby: a gunnysack, orphan eyes, sprites "standing up for their rights." It ends with what resembles crowd noise but probably is supposed to be some sort of protest or battle charge from the sprites, who we've apparently been defiling with our urine. Regrettably, the strange lyrics pull attention away from the music. The bridge weaves a beautiful tapestry of violin and lap steel that would have been much better represented if reworked as an instrumental. 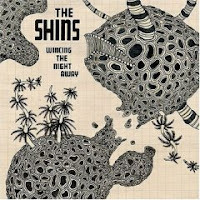 Other tracks show the Shins tinkering with their glimmering-pop formula. On "Pam Berry," a guitar helicopters around as Mercer stretches his vocal range, hitting a lower register, going softer and, ostensibly, tightening his throat. "Spilt Needles" makes good use of treated guitars. "Sealegs" takes a generous swig from the brew marked "funky" --- if not from the bottle, then maybe from a teacup. Opening track "Sleeping Lessons" burbles like an inverted version of The Chordettes' "Mr. Sandman" and floats around in amniotic tranquility before it breaks into a sprint. "Black Wave" favors similar atmospherics, and both bring to mind the frosty blues and grays of "Eternal Sunshine of the Spotless Mind." As it turns out, the Shins didn't need that film. They did one better, infiltrating not only a successful movie's soundtrack, but also a line of dialogue. The film, of course, was "Garden State." And the line was one nobody seems to be able to forget.